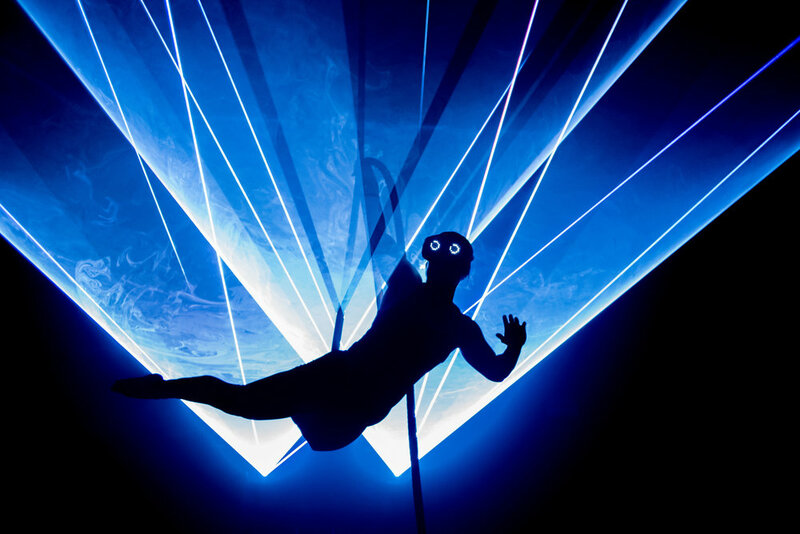 LIQUID SKY is a new piece of visual theatre exploring the interface between sonic art and aerial circus, within a laser light scenography. Audiences are immersed in an otherworldly environment that sits between an AV concert and a live art happening. Hypnotic and ritualised movement on the ground and in the air is paired with a Dark Wave live set of throbbing synthetic hymns and mesmeric vocals from sonic priestess SUE ZUKI. I want to go again. I want to take my friends. I want to watch from other angles. I want to take in more of the never-repeatable nuances of swirling clouds and light. I want to rejoin the communal rites of turning our heads to the sky and moving our bodies subtly to the beating soundscape. Liquid Sky thrilled my senses with beauty. I want more of that please. Funded with the support of Tramway, Creative Scotland, Swedish Arts Council and Swedish Arts Grants Committee.